Confession time: Though I wrapped this blog yesterday, we’re still going for a couple of days. It’s all a big misunderstanding. When I decided at the end of 2013 that 2014 was the fifty-second anniversary of the release of Bob Dylan’s first album and that I would write about one year of Dylan’s life per week I forgot one little thing: There are fifty-three years from 1962 to 2014 if you include those years. Oops. So 2014 is now the encore. Back in February my Facebook and email in-box were flooded with outraged people asking for my comment on Bob Dylan’s Super Bowl ad. I calmly reminded these people that in my world it was 1967 and Bob Dylan was holed up in his house in upstate New York and so they’d have to wait. Besides, I hadn’t even seen the Super Bowl ad. That was the truth. We hosted a Super Bowl party this year and I recall nothing of the game other than the Seahawks scored on the opening play and that the Broncos never did a single thing. It was the worst Super Bowl in at least a decade, and we had a house full of drunk people playing ping pong and screaming children playing ping pong and it was all quite chaotic and I didn’t pay any attention at all. I mean, none. I knew Dylan was doing the ad because every advertiser sends out press releases about these things, but I missed it. Wait, what? Poor Chobani. They shell out all the money to get a Dylan song for their ad, and they get such a nice big bear, and no one is outraged by it or talking about it in the morning. This is about the dozenth tv ad to use a Dylan song (I’ve detailed each and every one this year) and it is one of the better ones, although it’s still not good. I’m not sure how many ads are actually good though, if you know what I mean. It didn’t make me want to eat their yogurt, and I like yogurt well enough. Eat it almost every day! Frankly, that’s way better than the Dylan ad. It’s interesting to note how many of the same exact shots are used in that ad and in the Eminem ad. 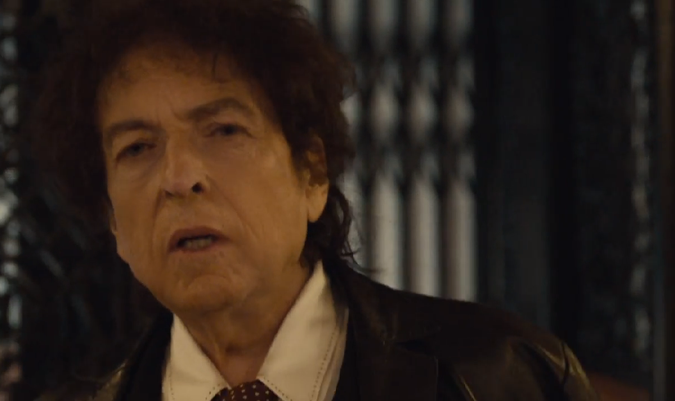 So, the Dylan ad, which cost $16 million for Chrysler to air, ran at the end of the third quarter. The game was 36-0 at that point and I’m not sure that even people in Seattle were still paying attention at that point, so Chrysler is lucky that the whole world freaked out and started re-tweeting this thing or no one would have ever seen it. This article collects collects a few of the typical tweets from media types. Let’s get a couple of things straight. This was not the first time Dylan had appeared in ad (Victoria’s Secret 2004). This was not the first time that Dylan had appeared in a car ad (Escalade 2007). This was not the first time Dylan had appeared in a Super Bowl ad (Pepsi 2009). So, really, what was this issue about? Probably people were bored by a 36-0 football game. And, also, Twitter is ruled by snarky people with no historical consciousness. As for the ad itself, it’s certainly Bob Dylan’s second-best car ad, but it is his best Super Bowl ad (that Pepsi one was dire). I don’t think it sold a single Chrysler 200, but then again I’m not sure I’ve even seen a Chrysler 200 on the road. The whole “Buy American” thing is odd coming from an Italian car company (Chrysler is owned by Fiat) but at least the 200 is made in Michigan, and I do hope that Detroit is able to find a way to rebound. The ad also led to a lot of late night chatter, including this from Conan O’Brien. Not great. OK, the Japan bit was funny.